You will make quite an impression next time you invite your friends round for a meal. Nothing says Italy like its food, and nothing says Italian food like pasta. Wherever Italians have immigrated they have brought their pasta and so today it is basically an international staple. Pasta is the dish that defines Italian cuisine. From a simple recipe of wheat and water comes endless shapes and textures, each marrying to a particular recipe. Beyond these two simple ingredients are centuries of tradition by which pasta was not only created, but perfected. 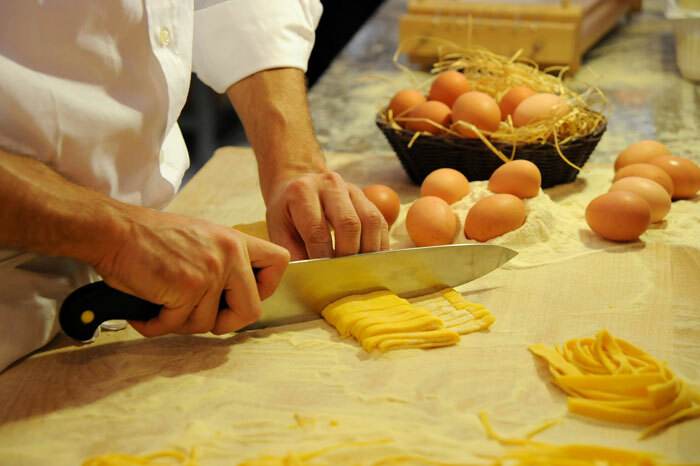 Join the fun, learn about Italian traditions and improve your own delicious pasta in Neapolitan Restaurant with rich history in the center of Rome! Receive Restaurant certificate, acknowledging your participation in the seminar/class. Arrival at the restaurant 9:30-10:00 a.m.
Introduction to the chef who presents a brief historical-cultural introduction on the traditions of the Italian Mediterranean kitchen – the great kitchen – and ensuing historic-social evolutions, followed by instructions on the preparation of hand-made “pasta all’uovo,” and two types of sauce. 12:30 p.m.: Lunch and seminar (upon request) on the production and diffusion of wines from Lazio. Structural and agricultural characteristics. 2:00 p.m.: Conclusion of the course and presentation of a diploma of the Restaurant attesting to participation in the seminar. Not included: Drinks, transportation, room and board or any other excursions.